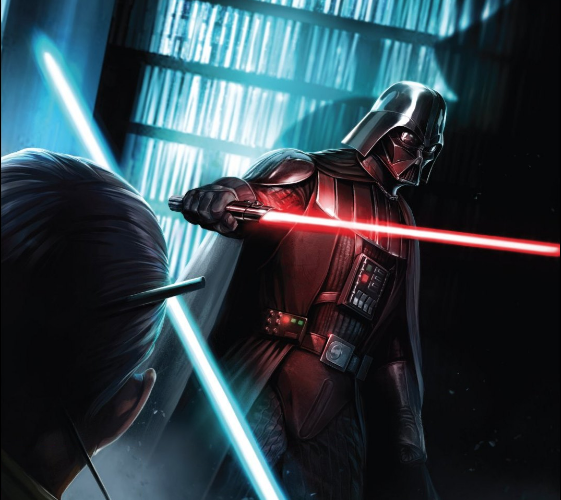 Darth Vader #9 Review – AiPT! An epic lightsaber battle is a highlight of this excellent issue. To celebrate the release of Star Wars: The Last Jedi, throughout the entire month of December AiPT! will be covering all the latest news and updates, reviewing the latest comics, teaching you how to build your very own lightsaber on our YouTube channel, breaking down all the best theories on our podcast, showcasing the best cosplay, ranking the best Sith/Jedi and so much more. Get hyped for Charles Soule’s Darth Vader series in part because it reveals in-canon elements, but also because, well, Darth Vader! The series has been a delight as it reveals it’s not so easy for this Sith Lord as he faces trials we never even knew about. Giuseppe Camuncoli has drawn one heck of a story arc so far, especially when it comes to the space scenes and backgrounds. He enriches these environments with such detail you’ll believe Darth Vader really did (and according to canon he did) go through these adventures. Makes you wonder if anyone ever tried the “Dress as Darth Vader” trick? If you like lightsaber battles you’ll probably love this issue. It involves one of the last Jedi battling with a Grand Inquisitor in a library she once was in charge of. Given he’s not a Jedi and he’s reading her books you can see why she’d try to strike him down. Now that said, aren’t Jedi supposed to be pure and all good? That’s an exciting element that Soule continues to draw out with this new arc as we see Jocasta Nu may be a bonafide Jedi, but she also has her faults. Her ego is an element Darth Vader and the Emperor counted on as they need her alive in order to capture the last remaining Jedi secrets. Vader must also go up against a Jedi enemy that’s ancient, but also formidable. All in all, if you dig action and lightsabers (especially grouped together) you will love this issue. There’s also a bit of character work done between Nu and the Grand Inquisitor who share a special relationship. Soule pulls out some interesting tidbits which further reveal the Jedi may not have been so perfect as they let a potential Jedi fall to the wayside. It also allows the reader to learn a bit about Nu and to get more on her side as she’s fighting an uphill battle. Camuncoli draws the best issue of the arc so far. From the opening scene of Darth Vader flying high amongst a dazzling city to the choreographed fight sequences, it’s a feast for the eyes. The final three pages, first with a double page layout using 12 panels to convey the fight Vader is going through juxtaposed with Nu’s rush to find something, then the final page revealing something truly new to the universe, are excellent. The colors by David Curiel strike a nice balance that allows the brightness of the lightsabers to stand out and look/feel special. One could argue Darth Vader isn’t in this issue much and instead is chasing Nu down and falling a bit behind. It didn’t bother me one bit though, especially with the solid art and writing going on. What an excellent issue! It not only contains a ton of lightsaber action, but an interesting gizmo reveal that could enrage fans or delight them. This series always seems to surprise you no matter how well you know the Star Wars universe. An awesome action-packed issue with big reveals and good character work.